Aaron G. Frenkel and Chief Rabbi of Russia Berel Lazar, together with other Jewish world leaders, have visited the Romanian hometown of Elie Wiesel, Sighet. SIGHET, ROMANIA, November 15, 2018 /EINPresswire.com/ — Vice President of the World Jewish Congress Aaron G. Frenkel, and Chief Rabbi of Russia Berel Lazar, together with some other prominent Jewish world leaders and rabbis, have visited the Romanian hometown of Nobel Prize laureate Elie Wiesel, Sighet, on the eve of his 90th birthday. 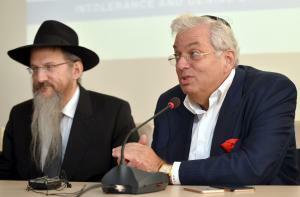 During the special occasion, taking place at the Holocaust survivor’s house, which is now serves as a museum for the Holocaust remembrance, Frenkel and Lazar took part in a unique interfaith dialogue, dealing with the burning issues of antisemitism, xenophobia and violence. The event, initiated by March of the Living and Limmud FSU, took place just two months after the anti-Semitic graffiti were daubed on the walls of the Wiesel family home, with a goal of supporting the local community. It was held with the participation of members of the religious communities of Romania.